We’ve all been there. Some days are better than others. Some days the sun shines, and other days it rains. And then it pours. It’s been like that for me this week. It’s not anything with me personally, but plenty of things are going on around me and I tend to be affected by it. Couple that with the fact that both dogs contracted kennel cough from being boarded while we were on vacation and that about sums it up. Always looking at the glass as “half full,” the fact that the week is just half over gives me plenty of time to look for the rainbow. Because there always is one. When I smelled these beautiful organic strawberries the other day, I immediately put them in my shopping cart. They are perfect for adding to smoothies, as a reach-in-the-refrigerator-snack or I could slice them and put them on top of yogurt. But, really, considering it’s already been “one of those weeks,” I needed something that would make me smile. Ice cream does that for me. With two cans of full fat organic coconut milk in the pantry and those beautiful organic strawberries in the fridge, the vision of strawberry ice cream flashed before my eyes. Once the idea came to me, I knew I was not going to stop thinking about it until I was sitting down, smiling, breathing deeply and savoring a generous serving. The minute I tasted the strawberry ice cream, everything seemed better. And I knew that was my rainbow. Sweet, colorful, healthy, dairy-free, satisfying and paleo. The next time you need a little lift–a little something to make you smile when things around you seem to be in chaos–may this treat be your rainbow. Depending on the season, you can easily replace the strawberries with blueberries, raspberries or peaches. Just be sure and use organic. If you want a vegan ice cream, you can also omit the egg yolks, although they are what gives the ice cream the creamy texture. Pour the two cans of coconut milk in a medium saucepan and heat over medium-high heat. Add the salt, honey, coconut sugar and vanilla and stir well so that the honey and sugar melt thoroughly. While the milk is warming up, place the washed and hulled strawberries in the blender and add 1 cup of the warm milk from the saucepan. 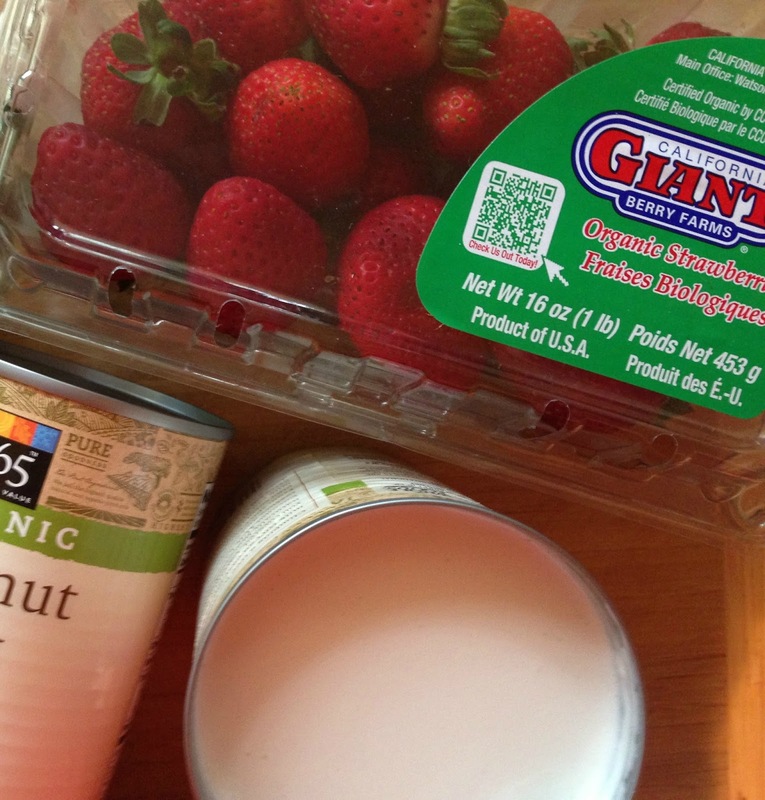 Puree briefly or pulse a few times so that the berries blend with the milk, but leave a few chunks if you can. Then pour everything back into the saucepan and continue heating. 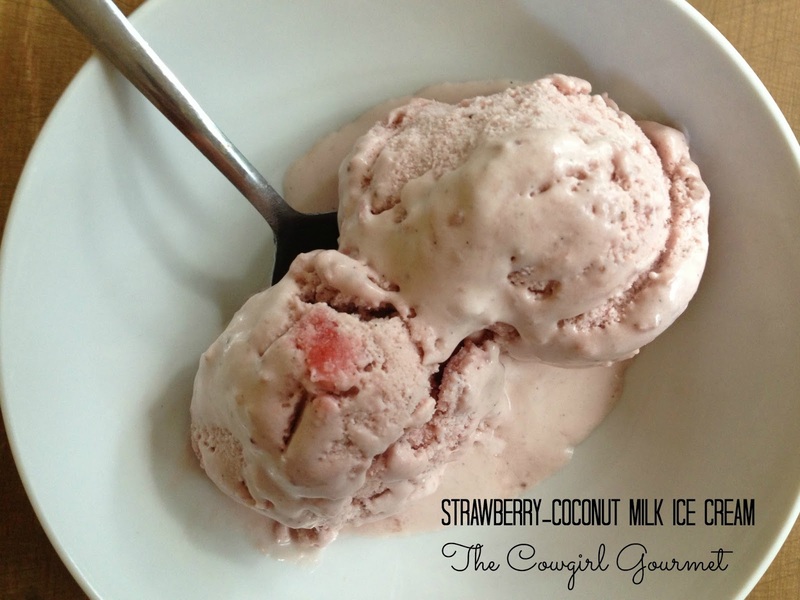 Now you have a beautifully colored strawberry-coconut milk mixture. Stir well to combine and taste for sweetness. If needed, add another tablespoon of coconut sugar or another drizzle of honey. Stir well to blend and taste again. Depending on the sweetness of your berries, it should be perfect--neither too sweet nor not sweet enough. Crack each egg in a small bowl leaving the whites and then place the yolks in another small bowl. Whisk the yolks to combine and reserve the egg whites for another use. To the egg yolks, slowly drizzle 1 cup of the warmed strawberry milk stirring constantly so they do not curdle. Then add the egg yolk-strawberry milk mixture back to the saucepan and stir for about two minutes. Turn off the heat. Let the mixture cool and then pour in a glass or metal bowl, cover and refrigerate for 3-4 hours or until chilled through. Process according to the directions of your ice cream maker. Once the ice cream is ready, you can serve it immediately as soft serve style or place in a container and let it harden in the freezer for an hour or more. Once the ice cream is hardened from the freezer, let it sit out for about 5-10 minutes before serving. Scoop in a bowl, serve and smile.